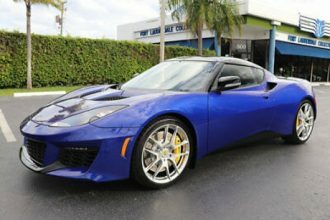 Yet, because it is a Lotus, the Evora 400 features zero-lift, although the aero package increases downforce by 50lbs 23kgs at V-max, to make more efficient use of its immensely capable road manners. 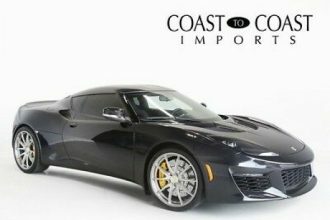 This Evora 400 comes with a 3-Year/36,000 Mile Limited Warranty and 8-Year Chassis Corrosion Warranty, and 3 Years of Complimentary Routine Maintenance. Contact us now at 631-318-2031 for more details! Metal-Look Instrument Panel Insert, Metal-Look Console Insert, Aluminum/Metal-Look Interior Accents and Leatherette Upholstered DashboardLeather w/Technical Fabric Inserts Seat TrimLeatherette Door Trim InsertManual Air ConditioningManual Tilt/Telescoping Steering ColumnOutside Temp GaugePerimeter AlarmPower 1st Row WindowsPower Door LocksProximity Key For Push Button Start OnlyRedundant Digital SpeedometerRemote Keyless Entry w/Panic ButtonRemote Releases -Inc: Power Cargo Access and Power FuelSport Leather/Metal-Look Steering WheelSystems MonitorTrip ComputerUltra-Lightweight Heated Sports Seats Mechanical Features 15.9 Gal.